The appearance in the house of various insects is an extremely unpleasant event for Housewives. Despite the fact that the bugs are small in size, they are able to bring a lot of problems. At detection of pests in the house , you should immediately begin to struggle with them, and not wait for the moment when they will reproduce. - "Thunder 1 or Thunder 2". Bugs-borers to Detect these bugs can be small holes on wooden surfaces and by the presence of wood chips. To start a fight should immediately, otherwise the whole furniture will soon become worthless. The affected area treat special tool "Belinsky library Belated". Helps to deal with the bugs "Woody healer". 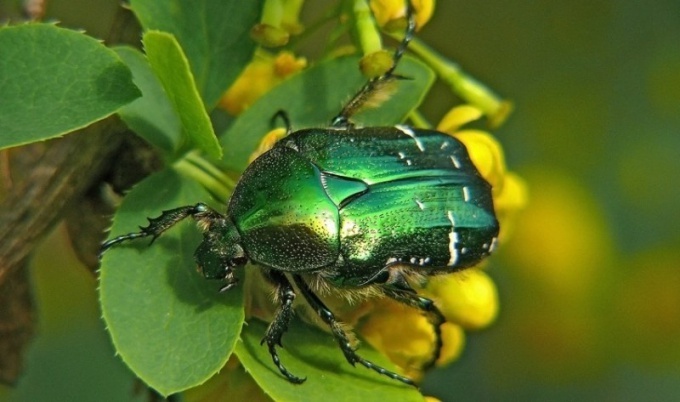 This drug can be used to remove beetles, and to prevent from their appearance. Lubricate the surface of the furniture with vaseline oil. In holes gnawed by wire, squeeze the prepared mixture. To do this, mix one part kerosene to three parts of turpentine. Seal the hole with wax or paraffin. So the bugs did not appear in the future, often try to ventilate the room, MOP the floor and to take care of your furniture. Bugs in cereals and muteki bugs a bit, then stocks it is possible to save. Be sure to sift the flour through a fine sieve and warm it in the oven at a temperature of 40 degrees. Pastas and cereals loop manually and too warm at 50 degrees. Try to keep cereals and flour only in glass or metal containers. The shelf and Cabinet where he kept the stocks, flush the soapy water with baking soda or wipe with vinegar. Next to the tanks be sure to put cloves of garlic. This smell repellent effect on bugs. As preventive measures, make of canvas small bags and boil them in strong salt solution for about 30 minutes. Let them cool, then remove and Pat dry. Don't forget to iron them flat irons. In such bags, then you can safely store flour or cereal without worrying that it will infest pests. Bugs at room rasteenie of all, isolate the affected plants from the rest. 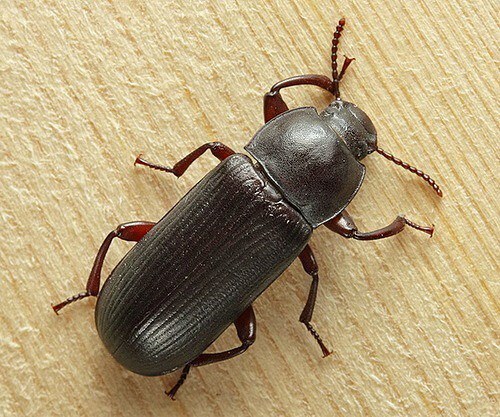 Because the beetles active in the dark, at night with a flashlight, collect all visible animals and destroy them. The plant will transplant into a different soil, carefully washed the root system. Leaves, if desired, can be rinsed in soapy water. Land as prevention pour means "Thunder 1 or Thunder 2". And the flower spray "Zircon". Pest control - bug Extermination. Pest control: Extermination of the bug. The beetles have proven to be the most diverse and numerous order of insects. Today studied and described more than 250 thousand species of beetles. Every year this list join thousands of new, previously unknown to science species. If the house is infested with wood beetle, wipe with a decoction of wormwood all wooden objects. Highly polished furniture should be treated regularly with any polishing product (Tana "Polish") , but unvarnished and unpainted surfaces wipe with a cloth slightly moistened with a vase by linowy oil or a mixture of 3 parts turpentine and 1 part kerosene or gasoline. Now sell special products from beetle wood. Coleoptera, or beetles, the largest order of insects, numbering more than three hundred thousand species. This is more than a third of all known insects. On the territory of Russia can meet only a small part of them, not more than ten thousand species of beetles. Some of the most common representatives of Coleoptera in Central Russia – bronzovoi. Their color and species diversity is very large, and they feed mainly on flowers of various plants and fruit trees, while not causing damage to agriculture. Bronzovoi are found throughout Eurasia, with the exception of mountainous terrain and deserts, are the daily way of life, like Sunny weather and almost never eat on cloudy days. In this weather these beetles behave very passively, hiding under the leaves of the plant roots. Bronzovok virtually no special protection, they are not poisonous and are easy prey for birds such as magpies, jackdaws and rooks. Seven-spotted ladybug found not only in Central Russia but also in other areas in the far East, Central Asia and even in North Africa. This beetle is a real predator, the main food for the seven-spotted lady beetles are other insects. This species was transferred to North America to combat aphids populations. The seven-spotted Ladybird enemies – parasites, bugs and fungi that attack mostly pupae of this useful insect and feed on them. Seven-spotted ladybug is not to be confused with other subspecies of ladybugs, for example, dvadtsatisemiletny, or potato, which cause damage to agriculture, destroying crops. From the birds, these insects are protected by a special toxic fluid which is harmless to humans. Not the last place in the list of beneficial beetles that live on the territory of Russia are occupied by jugglery. Most of these insects – not just predators, but the real destroyers of harmful insects for agriculture because of jugglery propagated artificially, and today are found almost worldwide, with each year increasing the population and species diversity. But there are among these insects and pests, for example, bread jorgelina. This beetle feeds on the grains of barley, rye and wheat, and its larva eats the stems and leaves of these crops, cereal crops causing serious damage. Among other Coleoptera pests Colorado potato beetle stands out. Appearing for the first time in America, this insect has spread throughout the world, including in Russia, being first in the West, and by 2000 reaching Primorsky Krai. Of aquatic insects it is worth noting predacious diving beetles, are permanent residents of freshwater bodies, which are found in Russia is almost everywhere. It is quite full of bugs, they can even fly, but they do it very reluctantly, and then only in order to change the reservoir more suitable for them.